Hi readers, I hope you guys are having an awesome weekend. As for me, I'm sitting at my desk drinking a cup of coffee and enjoying myself. Thursday was a pretty boring day, so I decided to set up in my kitchen in natural light to record a makeup video. The only thing I hate about the camera being used is that it doesn't have a flip-out viewer. It would be so much easier to have one instead of using a mirror to put on makeup, anyway e.l.f is a product I'm always using to achieve pretty looks on a budget. 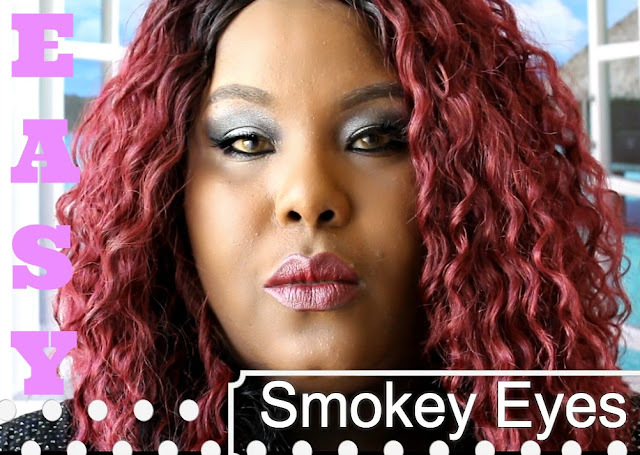 The Smoky palette by them is pretty cool and the eye look is cute for a date night out. This look can go with any outfit you choose, and since it's Spring, leggings and a pretty glitter top and flats would go great together. (Watch in 480 Quality) I decided to do a pre- birthday look for myself and I thought this look was such a pretty, classy look for a mature woman as myself, I call it Pink Purple Haze. Even though I didn't make any special plans for that day, I stayed home and cooked a huge pot of seafood gumbo and had cake. Boy was this cake delicious! Lasted only 2 day lol!